Place the garlic on the chopping board with some salt and pull the knife over it repeatedly to turn it into a paste. Combine the garlic, sesame oil, pepper, chopped rosemary, sesame seeds and olive oil in a large bowl. Toss the diced rump through the sesame/garlic mixture. 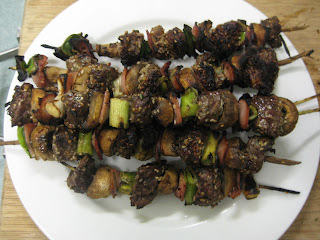 Remove the stems from the mushrooms and quarter them. 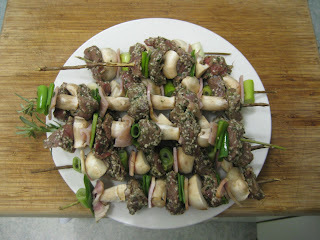 Feed the ingredients onto the rosemary skewers - beef, mushroom, bacon, spring onion - repeat. Barbecue, top with a little horseradish sour cream and eat.